During normal digestion, food is chewed and swallowed, moving from the mouth through the esophagus and into the stomach. In the stomach, food is digested by hydrochloric acid and an enzyme known as pepsin. As the food continues through the gastrointestinal tract, it moves into the duodenum, the upper part of the small intestine. Here food continues to be digested and absorbed on its way to the large intestine. A peptic ulcer can form in the lining of the stomach or duodenum, where digestive fluids such as acid and pepsin work. 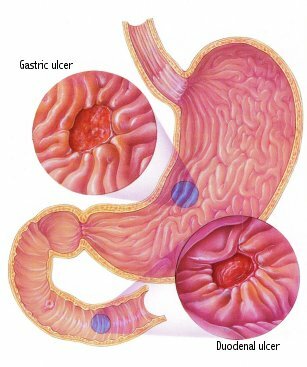 An ulcer that occurs in the stomach is a gastric ulcer. If it forms in the duodenum, it is known as a duodenal ulcer. The symptoms of gastric and duodenal ulcers are somewhat different, but the treatment is often the same. Scientists know now that these ulcers are most often caused by bacteria called Helicobacter pylori and they can be treated by antibiotic drugs. The other common cause of gastric ulcers is non-steroidal anti-inflammatory drugs such as aspirin, ibuprofen and naproxen. H. pylori bacteria work their way into the mucous lining, damaging normal defenses of the lining and making it vulnerable to acid and pepsin. It even increases acid production, worsening the inflammation. Ulcers are actually small lesions or holes in the lining of the stomach or duodenum. Each year, 4 million people suffer discomfort from an ulcer, and 40,000 need surgery. For many years, doctors believed ulcers were a result of emotional stress and irritating foods. More recently, ulcers were thought to be due to a defect in the stomach’s natural defenses against digestive liquids. But most peptic ulcers are a result of infection with Helicobacter pylori, bacteria that live in the stomach. H. pylori cause an inflammation known as gastritis. Gastritis is common, causing no symptoms or complications, and affects one-half of people ages 50 to 60 years. Diet, smoking, alcohol and stress do not contribute to ulcers. However, smoking slows ulcer healing. Protecting the Stomach Lining: Ulcers form when the stomach and duodenal tissue cannot defend itself against acid and pepsin. Normally, these tissues produce mucus to coat their lining. Bicarbonate is also produced to help neutralize the digestive liquids. The stomach and duodenum also protect their lining by constantly repairing damaged cells. H. pylori live in the stomach by producing an enzyme called urease, which neutralizes stomach acid, allowing the bacteria to survive and attack the lining of the stomach and duodenum. This spiral-shaped bacterium damages the normal defenses of the stomach wall, making it more vulnerable to acid and pepsin. It even increases acid production, making inflammation worse. Non-steroidal anti-inflammatory drugs such as aspirin, ibuprofen, and naproxen, available by prescription or in lower doses over-the-counter, also cause gastric ulcers. These drugs interfere with the normal defenses used by the stomach to protect its lining. The ulcer heals in most cases when these drugs are discontinued. Symptoms of a gastric ulcer include a gnawing or burning pain in the abdomen. It is usually made worse by food. Gastric ulcers can cause nausea, vomiting and weight loss. Slow bleeding from an ulcer can cause anemia and fatigue. Heavy bleeding can cause vomiting of blood or black stools. Symptoms of a duodenal ulcer include the same burning pain in the middle of the upper abdomen or on the right side. It is worse between meals, after eating or during the night. Duodenal ulcer pain is relieved by food or antacids. Diagnosis of a peptic ulcer is made after an upper GI series, including an x-ray of the esophagus, stomach and duodenum. Endoscopy allows the doctor to see the entire esophagus, stomach, and duodenum with a small tube inserted through the mouth. H. pylori bacteria can be detected from a blood test, breath test or from a tissue sample. Bleeding can occur when an ulcer forms near a blood vessel. If the blood vessel is small, the bleeding will be slow, causing weakness, dizziness and fatigue. If the blood vessel is larger, bleeding may quickly become dangerous. Treatment: Drug treatment for ulcers due to H. pylori may include bismuth subsalicylate, metronidazole and tetracycline. It is important that patients understand directions. A duodenal ulcer from drug use may be treated with an acid blocker (Tagamet, Pepcid, Zantac or Axid) or an acid inhibitor (omeprazole or lansoprazole). A mucosal protector drug (sucralfate) is also prescribed. Patients who do not respond to drugs or develop complications such as bleeding or perforation may require surgery. If you have questions about treatment, ask your pharmacist.